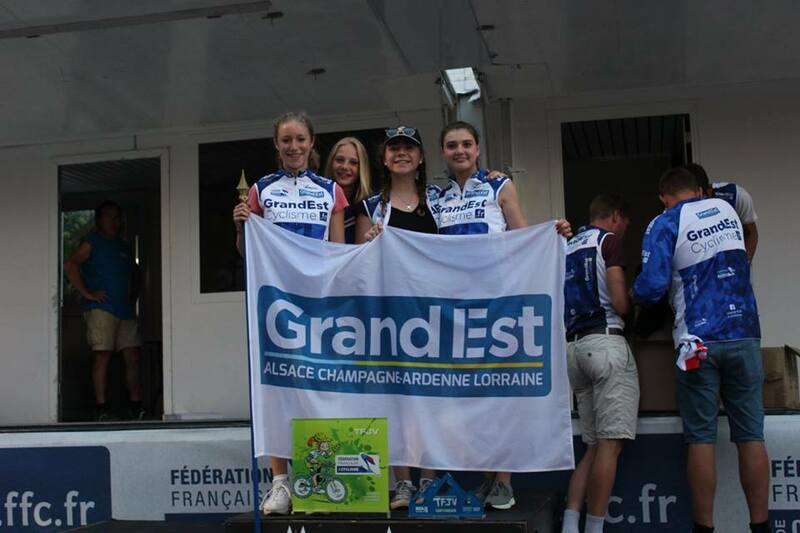 The name of Region Grand Est was chosen in April 2016. Of the nearly 290,000 votes by the inhabitants on the Internet, 75% (215,530 votes) went to "Grand Est", ahead of "Nouvelle Austrasie" (10.4%, or 29906 votes), 9.8% for Rhin-Champagne (9.8%, or 28080 votes) and 4.8% for Acalie (4.8%, or 13,904 votes). The name was officialy adopted in October 2016. The flag of Region Grand Est was used during several events (sports competitions, worldskills events....), with the Region's logo placed either on a blue (photo) or a white (photo) field. The flag of Region Alsace was a banner of the simplified arms of the traditional province of Alsace, "Per pale, 1. Gules a bend sinister cotised fleury argent (Lower Alsace), 2. Gules a bend between six crowns bendwise or (Upper Alsace)". These arms are based on the Alsatian arms, already documented in the 16th century but hardly used since then. Instead of the two confronted bends of the traditional arms, the new arms have kept only the white bend representing Lower-Alsace. The crowns representing Upper-Alsace are now placed on both sides of the white coticed bend. These arms have been designed and used by the Regional Council since the 1990s. The new flag is hoisted over the building of the Regional Council of Alsace in Strasbourg. Beforehand, the Regional Council used the flag of the traditional province of Alsace. White flags with the Regional Council's logo (photo) were sometimes used in the 1990s and onwards. Created in 1987, the logo of the Region shows two yellow and green hearts entwined. In a Region without much of a strong common identity between its constituent departments, they symbolize the union through which a feeling of regional identity should develop. Yellow and green stand for the Region's ressources: yellow for vineyards, champagne and the cornfields as well as for the Region prestigious past; green conveys the idea that Champagne-Ardenne nature is rich in forests and rivers. The flag was also used with the full version of the logotype of the Regional Council (photo, Regional Council). Before 1987, the flag was white with a totally different logo (Luc Doublet. L'aventure des drapeaux [dou87]). Rarely used, this flag was hoisted on a hotel in Metz, closed to the provincial flag and on a secondary school, owned by the Regional Council. In January 1999, the Regional Council replaced the word "région" by "conseil régional" in the same font, but placed below "lorraine". The reason for the substitution of is the misuse of the former logo, not connected enough to the regional institution in several cases. The logo was designed by CharlÉlie Couture, a French artist (singer, painter, photogaph, writer) born in Nancy. Beforehand, the flag was white with a totally different logo (Luc Doublet. L'aventure des drapeaux [dou87]).